For the first time in more than four decades of polling on the issue, a majority of Americans favor legalizing the use of marijuana. A national survey conducted in March found that 52% said the use of marijuana should be made legal while 45% said it should not. 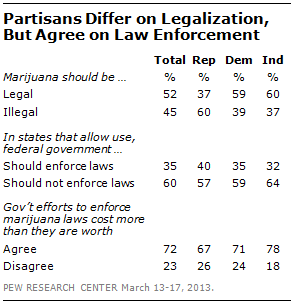 There were partisan differences over legalizing marijuana use. About six-in-ten (59%) of Democrats favor the legalization of marijuana use compared to 37% of Republicans — a difference of 22 percentage points. Independents favor legalization by about the same percentage as Democrats. More Republicans (47%) than Democrats (26%) also say that use of marijuana is morally wrong. Again, the views of independents are closer to those of Democrats, with just 28% considering marijuana use to be morally wrong. But Democrats and Republicans do find agreement when it comes to enforcement of laws on marijuana and whether that effort is worth it. Roughly equal numbers of Republicans (57%) and Democrats (59%) say that the federal government should not enforce federal marijuana laws in states that permit its use.